Combined heat and power (CHP) provides year-round baseload energy in microgrids — something renewable resources don’t do. 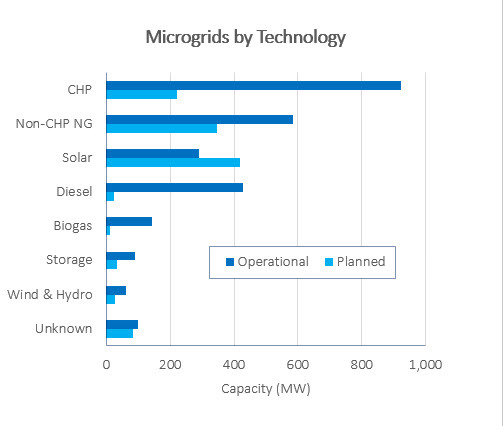 Yet solar PV now overshadows CHP in planned microgrid projects, according to a new microgrid database by ICF. The reason? Microgrid developers are moving away from fossil fuels, Jones said. Instead, they’re installing solar and energy storage. Or others choose simpler, power-only natural gas generation, as opposed to CHP. Cost might be a factor, said Jones. It’s possible those who are developing microgrid projects think CHP is too expensive to incorporate. CHP is a resource that ICF carefully follows — it has been updating the Department of Energy’s CHP Installation Database for over a decade. The shift to solar is occuring despite the efficiency CHP affords. Used for more than a century, CHP uses the heat byproduct created during the generation of electricity. Its used to warm buildings, create cooling, produce steam or serve other processes that require thermal energy. In contrast, conventional generators waste the byproduct, letting it waft into the air or water. In all, the database identifies about 400 MW of planned solar PV, compared with about 200 MW of CHP for microgrid projects. However, because CHP operates 24 hours a day, it dominates based on operating capacity, Jones noted. 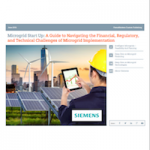 ICF created the microgrid database because of the industry’s’ growth. “Microgrids have really started to gain momentum,” he said. 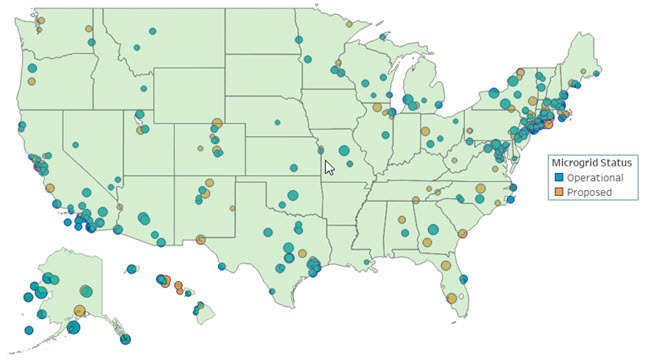 The consulating firm identified 211 operational microgrids in the US that yield 3.85 GW of capacity and 104 in planning that could produce 1.55 GW of capacity, when installed. Most — both operational and planned — can be found in the Northeast, with a large number also planned for California, Hawaii and Alaska. The database also found that community microgrids represent the fastest growing type of ownership model. That’s partially due to the NY Prize and other state incentives, including those offered by Massachusetts, New Jersey and Connecticut. “The community microgrids have more planned capacity compared to any of the other ownership types,” said Jones. ICF also found more projects now being planned and developed by end users, as opposed to utilities. However, that’s starting to change. In addition, utilities don’t want to lose their customers, he said. 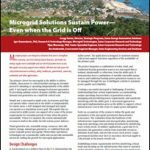 Installing microgrids helps utilities keep customers that might otherwise defect in favor of installing their own systems. “Utilities can offer reliability with local microgrids and keep customers and continue to serve them,” he said. The need for energy resiliency and reliability drives microgrid growth more than any other factor, according to Jones. “One of the big draws of microgrids is they are able to produce their own power during an outage, and we expect that to grow,” he said. Extreme weather in the Northeast, plus incentives, have prompted the additions, Jones said. On the West Coast, renewable energy policy has led to more planned microgrids in California. Given the recent hurricanes, Jones sees the need for energy resiliency driving microgrid growth, with state and federal governments offering more incentives for microgrids at critical facilities. Join us to discuss the latest microgrid trends at Microgrid 2019: Reshaping the Electric Grid, May 14-16 in San Diego. Feature photo courtesy of By Ultrashock/Shutterstock.com. Combined Heat and Power: Not the Brad and Jen of Energy, But…. 1- Renewable s- Solar and Fuel Cells, are getting the lion share of the Incentive Programs (ROI), self-generation CHP genset’s barely qualify for incentives with Biogas, and essentially no funding incentives for Natural Gas genset’s . 2- CHP generation does not qualify as ‘Emergency Backup Energy’, as would a Diesel genset (startup and load within seconds vs minutes for CHP genset), due to load handling characteristics.